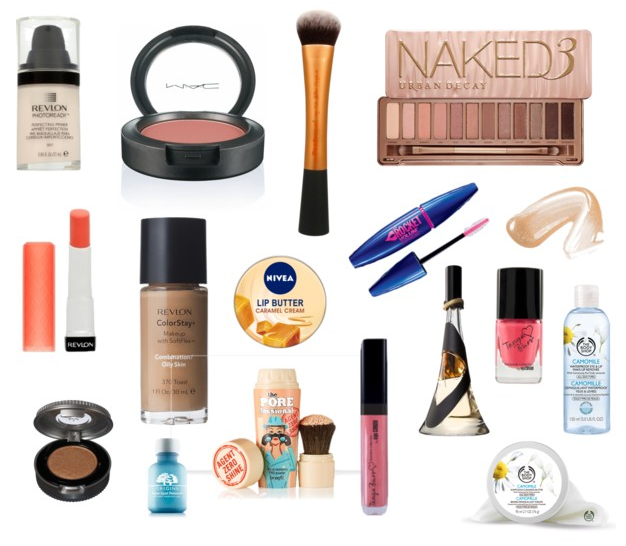 Beautiful You: Monthly Favourites | March 2014! Monthly Favourites | March 2014! After seeing Becky's post on my blog for guest week I wanted to do another one like it but I didn't know what to include. However, I have been changing up my make-up recently and I thought that I would share with you what I am currently using and loving right now! I have literally been in love with this primer recently, you may know if you live in the UK we have had a little bit of sunshine recently and this product has been my go to and it works amazingly well. It may be on the pricey side for a drug store primer but it lasts a really long time as a little goes a long way. I cannot rave about this enough! When I was buying the lipstick for my giveaway I couldn't leave without anything for myself because who goes into Mac and doesn't buy themselves anything? Well I have a pro blusher palette and I wanted this one to go in, however the Mac near me don't stock the pro inserts so I just had to buy it in the casing and I could always de-pot it and then I have the casing for back to Mac so it was a win/win situation in my opinion! This colour is so lovely, it is quite subtle and you have to build it up but I am loving it! I found this brush reduced in ASDA down to just over £5 and I was so over the moon. I had read so many posts and talk to so many people about this brush, I was previously using the buffing brush to apply my foundation but this brush gives a much more flawless finishes so I am glad that I picked this up! If you have been following my blog for a while you will know that this is one of my holy grail products. This palette is so versatile and easy to work with that I never find myself using anything else. It has an amazing colour selection and the only thing I have to say is that it is definitely more brown shades that black but that suits me so it is perfect! I am a lover of orange but I find that orange lipsticks can dry out quite quick, now it may just be my lips but hey, I've found a solution! This is the most moisturising, pigmented orange lip product that I have come across and I cannot tell you how much I love it! You all know that I love the colour Sweet Tart too but this has taken over at the moment, I cannot get enough! I bought this foundation of a recommendation from a friend called Frankie (I shall link her YouTube here) because she was telling how much she loves and and how well it lasts. The first couple of times I used it I wasn't sure because of the colour, it made me look really pale, but as soon as I started getting used to it I loved it. It is really bendable and there are many different shades that would suit a lot of people. This even covers the hyper-pigmentation in my cheeks so well that I don't have to put concealer on top which is a winner for me! This is literally divine, if any of you have tried it you will know what I mean. It is so moisturising and thick so I lasts a long time before it is soaked in but the smell, oh my gosh! I cannot describe to you how amazing it is, all I will say is that you need to buy it because it is HEAVEN. I am not one to review mascaras because I have abnormally long and voluminous lashes so my opinion can't really be relied on completely, but I couldn't not include this in here. I love this mascara because you can create a big, long, voluminous lashes with it but you can also very easily make them look really subtle and classy. It is a very reasonable price and I literally cannot fault it! I have really oily eyelids and sometimes I find it really hard to make my eye shadow stay for a long time but every since I have used this I don't have this problem any more. It is so cheap and I love it, the only down side is that I can only get it online and I have to wait until there are quite a few things I want to get before I can order it or wait for a deal to be running but it is worth the wait! I have been incredibly lazy when it has come to eye shadow recently, I don't know why but I just couldn't be bother to blend to much so I have been loving this eye shadow as a base all of the lid and then putting Burnout another Urban Decay shadow over the top. Then just adding a quick cat eye and mascara and that's it, so simple, easy and quick! I don't know about you but when it is coming up to a certain time of the month I get more spots that usual, it happens every month so it is normal to me now! However, recently I have come across this amazing product, it is a small bottle of gel that you put on your spot and it helps to clear them up straight away. I apply this as the last step in my skin care routine at night and then in the morning I will use my rose water spray to get rid of any product that remains. If you have read my last post you will know that I haven't been getting on with Rimmel Stay Matte powder currently and I had hear a lot of good things about this powder so I gave it a try! I am now on my second one which says a lot in itself because I re-purchased it. When you apply this powder it just makes you entire face look flawless and adds a slight hit of colour to the face which I love. I recommended this to my sister and she is now loving it too! I am loving this soooo much! It is the perfect pink colour without being to over the top and you can even wear it on its own and not over something and it adds just the right amount of sheen to your natural lips! I have 6 of her lip glosses and I just want more, they smell divine and last for such a long time! With them being £6.99 a piece who wouldn't buy them all?! I don't know why I have been wearing this scent a lot recently because I think it is more of a winter smell but I have been loving it! This is probably going to make you all laugh because it sounds stupid but I like to wear this perfume when I am wearing something a little bit more edgy and not very girly because I find the scent reflects this! But seriously the perfume is a musky, florally and vanilla scent and I love it so much. Plus look at the bottle, come on! I am a lover of anything coral or orange so this nail varnish is perfect! Not only the colour but the formula of Tanya's products is amazing and I can wear this for 3-5 days without any chips and this is hard to find in a nail varnish. I will definitely be indulging in more when my bank account is looking more healthy! I was given this as a present in my stocking at Christmas because I had be whining to my mum about how much I hated taking off my make-up on my eyes because they are really sensitive. So, my mum being my mum went online and read what would be best to use and she found this and my next item and decided to buy me them for Christmas. I cannot thank her enough because it is so gentle on my eyes and I love it! I can remember saying to my mum before Christmas that I wanted to try the Emma Hardie cleansing balm but I didn't want to splash out on it for it to not work, so she found this! It is a cleansing butter that you work into the skin in circular motions and you then wash it off with a face cloth. I have been using my one I got for Christmas since then and it has just ran out so I had to re-purchase because the result I got from using it were brilliant! It makes me skin so smooth and make is feel really clean like all of the make-up was completely gone from my face! It also leaves your face smelling really nice, I'm weird I know! I hope you enjoyed seeing what I have been loving at the moment, let me know in the comments if there is anything in particular that you have been liking recently. Also let me know if there is anything in this post that you would like to see reviewed as a full post and I will try my best. I have two giveaways running at the moment, a MAC lipstick giveaway for my 6 month birthday here and a twitter giveaway for reaching 300 followers here so go and enter them! See you guys on Wednesday!